An easy and comprehensive access to key information about 300 000+ wines to save you time and help you secure more business decisions. 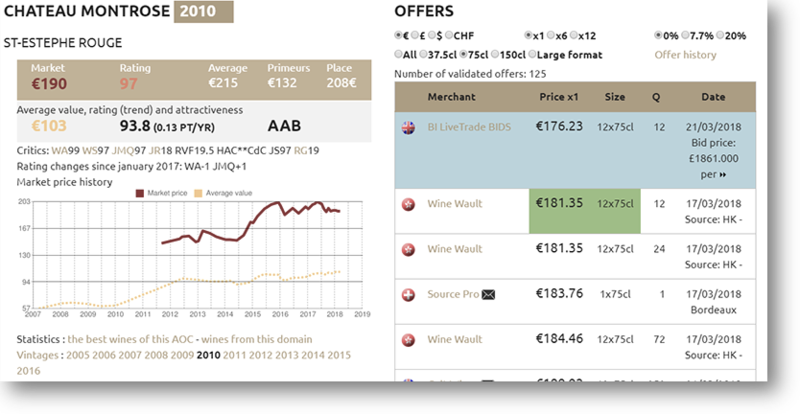 Simply the most powerful purchasing and pricing tool ever created in the wine industry. Discover how the power of batch processing will improve your pricing and analysis efficiency! A bespoke service to seamlessly integrate our data into your system to be connected with updated information without thinking about it. The most accurate stock and price information, updated daily, from the largest collection of B2B suppliers and the most renown B2C e-commerce websites. a source of truth to establish and provide a solid valuation. Since 2007, millions of records gathered to build the most representative indices on the fine wine market.